It is shortly after 9 p.m. on a Monday and Tyronda Whitaker has to pause for a few seconds to collect her thoughts. On the phone from her North Carolina home, the mother of Ohio State redshirt sophomore defensive end Tyquan Lewis is having a hard time putting into words what it is like watching her son out on the field for the Buckeyes. Once she gets going, Whitaker could seemingly talk about her eldest son for hours. She beams with pride and exuberance like any mother would; one can almost see the ear-to-ear smile on her face through the phone. As a single mother of four, Whitaker says she loves all of her children equally. But she also admits there’s something different about her relationship with Tyquan, her first born. Her pride doesn’t solely stem from Tyquan’s success on the football field, though. Sure, he’s a starting defensive end on the No. 1 team in the country, but this goes beyond that. She’s proud of Tyquan the football player, but even more proud of Tyquan the son and Tyquan the older brother. Whitaker has three other children in addition to 20-year-old Tyquan. Chris, the youngest, is 8; Tylie is 10 and Kenai is 12. All three run around town showing off their big brother whenever he returns home from college. They don’t have to tell people, of course, as “everybody in a 100-mile radius knows Tyquan Lewis is their big brother,” Whitaker says. To his brothers, though, Lewis is more than just the star football player. He’s someone they can look up to, a positive role model in their lives. Lewis means the world to those closest to him. Perhaps to best illustrate Lewis’ bond with his younger brothers, all it takes is a simple recap of one of his most recent trips back to his hometown last spring. The youngest of Whitaker’s four sons, Chris, tells everyone his oldest brother is his best friend. Because of that, every time Tyquan makes a trip home the two must have a sleep over. The only problem with that? Chris has a twin bed. 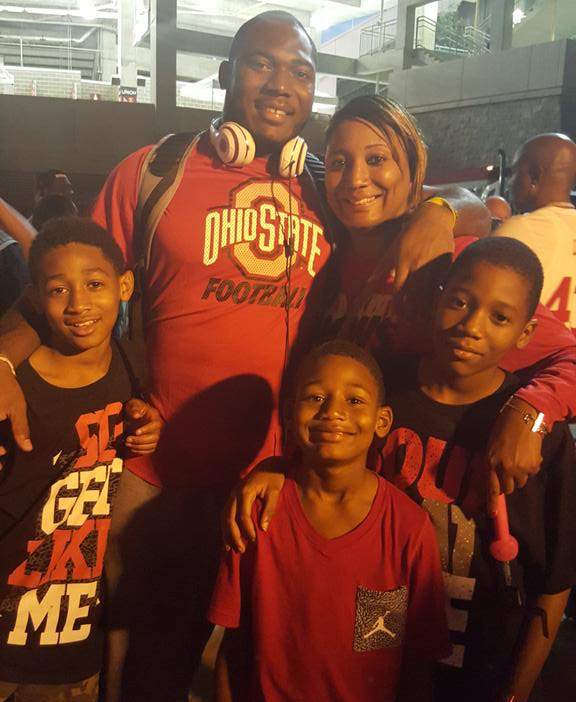 Tyquan Lewis poses for a photo with his mother and three younger brothers after Ohio State knocked off Virginia Tech (via Tyronda Whitaker). There’s an image. The 6-foot-4, 260-pound starting defensive end sleeping in a twin bed next to his 8-year-old brother. Those are the types of things that are important to Lewis, though. Family has always come first for him and it’s the main thing that drives him to be successful. His relationship with this three younger brothers is all part of that. The most recent of those trials came just days before Ohio State played Alabama for the Sugar Bowl last season. Lewis flew back to Columbus the day after Christmas when he received some troubling news. His great-grandmother, who had lived in the same house as the rest of his family, had passed away. Lewis was nine hours away and felt like there wasn’t much he could do. For a family that was so close, this situation was heartbreaking. It tested them, but for this group, it was just another hurdle. Nothing could unravel this unbreakable bond. Living in the heart of ACC country near Tobacco Road, Whitaker was never really keen on college football. She had always been an avid North Carolina basketball fan and her sons were, too. “Nothing Duke around here,” she says, laughing. But when it was clear Tyquan was going to be a star football recruit, Whitaker had to adopt the sport. She had to learn to love the game her eldest son did and be there for him throughout the entire process that is major college football recruiting. Lewis was a four-star prospect at Tarboro High School, where he starred at defensive end, but also played some tight end for the Vikings. Lewis did plenty of winning while at Tarboro, too, as the Vikings won three straight state titles under head coach Jeff Craddock. Tyquan was a starter on two of those teams and was a high school teammate of St. Louis Rams running back and former Georgia star Todd Gurley. When Lewis first discussed Ohio State with his mother, Whitaker admits now she wasn’t too high on the idea back then. Mom wasn’t exactly thrilled with the fact Columbus, Ohio was a nine-hour drive from her home in North Carolina. But Lewis was adamant about the Buckeyes. And after he and Craddock returned from a summer football camp at Ohio State, Lewis couldn’t stop raving about Urban Meyer and the rest of the Buckeyes’ coaching staff. She quickly found out, though, when Meyer and director of player personnel Mark Pantoni called the day after Lewis left his first visit. They wanted Whitaker to come up and check out Ohio State for herself. At this point, it was impossible for Whitaker to ignore her son’s enthusiasm for Ohio State, so she figured she’d hear them out. The two traveled back to Columbus roughly a month later for Ohio State’s annual Friday Night Lights camp. It was there where Whitaker realized she might not be able to keep her son close to home. On Sept. 20, 2012, Lewis sat inside the gymnasium at Tarboro High School, his mother to his right. His brothers also sat at the table, which had trophies from the Vikings’ success on the football field scattered all over it. After a brief message to the crowd, Lewis put on an Ohio State hat and pulled out a scarlet No. 1 jersey to hold up to the audience. A wide-eyed smile came across his face as he hugged his mother. The whole process was finally over. The first year Lewis was in Columbus, things back home were difficult for Chris, Tylie, Kenai and their mother. All four felt like they lost their best friend. Things are different now, but that first year was rocky. With Lewis now in his third year at Ohio State, both he and his family have adjusted to the long-distance relationship. Still, it bothers Whitaker that she and her three other sons can’t attend every one of Tyquan’s games. They get to a few a year — Penn State and Rutgers are on their schedule this year and they already went to Virginia Tech — but that still doesn’t sit right. Whitaker said she missed only one of Tyquan’s games in-person throughout his entire football-playing career: from pee-wee through high school. At Tarboro games on Friday nights, she and her three other sons sat in the same spot in the stands. Whitaker has learned to adjust to how different things are now, but that doesn’t mean it’s any easier for her and the rest of the family. “My son is on TV and he got his first sack of the quarterback and he’s making tackles," Whitaker said. "He’s living his dream and I’m watching on TV and it just don’t feel right." Whitaker and her three youngest sons stood outside Lane Stadium in Blacksburg, Virginia, on Sept. 7 waiting for Tyquan to arrive on the team bus. There was no way this family was going to miss the first start of his Ohio State career. When the 6-foot-4, 260-pound defensive end got off the bus and spotted his family, he quickly made his way over. Tyquan gave hugs and high-fives to everybody there; he had his typical ear-to-ear smile on his face. Lewis jogged out onto the field opening night for the No. 1-ranked Buckeyes and started at defensive end. That night, as Ohio State had to play without its All-American defensive end Joey Bosa, Lewis recorded six tackles (two for loss) and a team-high 1.5 sacks in the team’s 42-24 victory. Fast-forward five weeks and the Buckeyes are 6-0 as they prepare to welcome Penn State to Ohio Stadium Saturday. On a defense flooded with NFL talent, Lewis has been one of the biggest surprises for Ohio State this season. Playing on the defensive line with players like Bosa and future early-round NFL Draft pick Adolphus Washington, Lewis has more than held his own. He leads the Buckeyes with 5.5 sacks and nine tackles for loss this season. In Ohio State’s recent 34-27 road win at Indiana, Lewis was named co-defensive player of the game. Ohio State will stroll out onto the field Saturday night against the Nittany Lions in all black uniforms. The crowd, too, will be dressed head-to-toe in black. And somewhere in that crowd will be Lewis’ mother and three younger brothers. It will be their first opportunity to see Tyquan start a game in front of the home crowd. They’ll make the nine-hour drive from Tarboro, North Carolina, to Columbus to root on one of the most important people in their lives. Because this relationship is about much more than football for this family. It’s about a connection between a mother and her oldest son; an unbreakable bond between a big brother and his three younger siblings.